Meditation is about creating a pause, a break in the chaos of our day, to help us refocus our mind and keep calm in the midst of everyday busyness. Sound familiar, parents? I’ve found three simple ways to integrate meditation into my day. 1. While pushing the stroller. Getting two kids into a double stroller can be stressful at times (hello, tantrums! ), so while I push them in their stroller on their way to drop off at school, I listen to a guided meditation with the earphones in ONE ear. (The other ear is free to listen to cars, construction and other sounds I should be aware of). It’s a great way to get centered in the morning. When my little one naps, I take 2 to 3 minutes to practice trataka, a practice of concentration and focus using the eyes. I’ll find an object of focus—a flower if I’m outside or a candle flame if I’m indoors. First, I see the object in relation to the space around it. Then I see it as a whole, by itself. After that, I focus on each detail of the object, one-by-one. Then I see it again as a whole and finally, in relation to the space around it. 3. When putting my kids to bed. Yoga is about embracing duality, right? So if you have trouble making time to meditate, try these quick, easy and creative ways to multitask—er, integrate—yoga into your life. I’m absolutely ***Honored and Humbled*** to write for Red Tricycle!!! This post can also be found on their website! 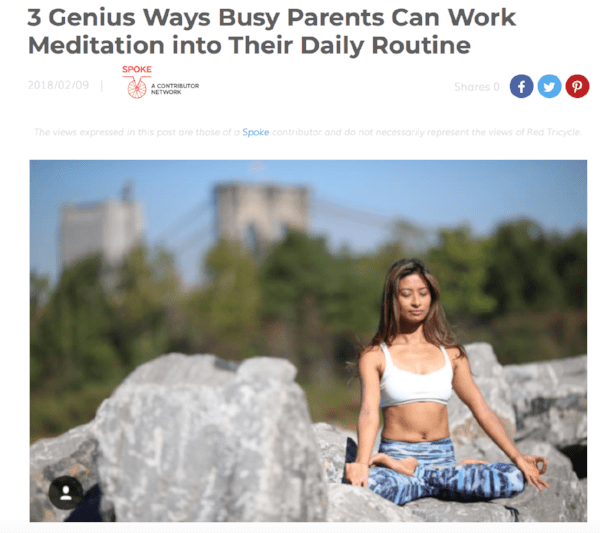 http://redtri.com/how-busy-parents-can-meditate-every-day/. Check out Red Tricycle for various topics including parenting, things to do for children, and events.